Pulse dialling still works OK in the UK. There's a good trade on ebay in old candlestick style Bakelite telephones from the 1930s. I've been tempted a few times but the missus wasn't impressed and vetoed it. 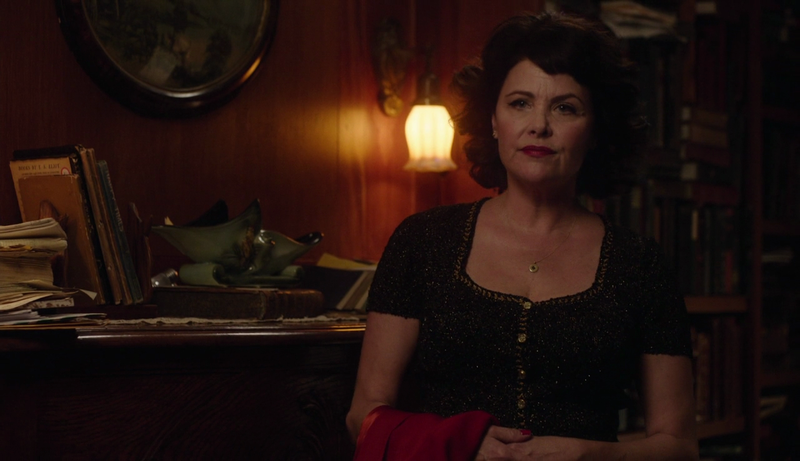 In this scene, the lamps behind Audrey above the fireplace seem to be upside down What could this mean in a traditional library/office ? There was speculation that a Dougie, Jane-E and Jade were in a world of their own until Ben got the key in the mail. I will keep wondering if Audrey is in a coma or in a black lodge of her own until we see her interact with other people we know to be in the real world. They can be adapted easily enough. We don't even know where they are located, though; could be some backwoods place where the network hasn't been upgraded. I wonder if there are clues to the book titles if we can see them? Ya I noticed that as well. Also, he states he does not have a crystal ball but on his desk is an object that looks like a crystal ball. It could be a snow globe though. Something is fishy with this whole scene! the placement & position of the lamps over the mantel like this are normal in an old parlor. one of the books is t.s. eliot. i can't make out any others, though i'm tempted to read the title of the blue book standing upright nearest the green candy dish as "happy times". In addition to the characters not moving from or changing their positions, and nothing being resolved, it does show Audrey really wanting to leave, but not being allowed, or able to go on her own. Like perhaps a coma patient not being able to get up and leave. I'm quoting one of the testimonies here: "It was one ongoing nightmare that I couldn't awake from... It took me MUCH longer to heal from the imagery in that coma than it did from the physical injuries." It's obvious that Audrey isn't having a very good time. And think about the seductive opportunity for Lynch to craft an elaborate coma dream. The more I think about it, the more the clues point toward fabricated scenario. I'll wait (impatiently) to see if this turns out to be true. Yes rotary phones still work. It's still weird that a seemingly important businessman would have one. My money is on Audrey Has Been Dreaming Since The 90s. But all the other stuff is real. I have watched the scene on quite a big screen and the hourglass on the desk (first shot of the camera moving along The room) doesn't seem to move at all.